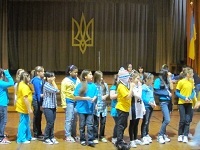 On Tuesday, February 1st, 2011 students at Assumption School had their first pep rally of the new year in hopes to raise our school’s spirit! On that day, there was also a variety of different hats roaming the hallways because it was Hat Day. The pep rallies most spirited grade was the 8th grade. When Fr. Ivan asked a few students on how spirited they were for the rally, one student proclaimed, “On a scale from 1-10, I think I broke the scale! !” So, all in all, the pep rally was a success! Everyone looked pepped up and school spirited.